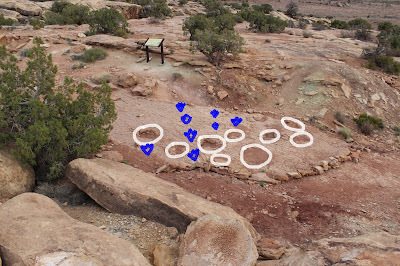 The Copper Ridge Dinosaur Trackway is located north of Moab, Utah. The site was discovered by Linda Dale Jennings Lockley in 1989. The trackway includes imprints left by a large turning sauropod brontosaur and four theropod carnivores of various sizes. The Copper Ridge site with its abundance of different tracks is a rare find. The Copper Ridge trailhead is about 2 miles east of Highway 191 on a dirt road that is accessible by car. The turnoff is across from the large microwave tower between mileposts 148 and 149. Immediately after turning east the dirt road crosses the railroad tracks where you will see a BLM sign for the 'Dinosaur Tracks 2 Miles'. The road might not be suitable during very wet weather. There is a register where the trail starts at the base of the hill. The trail climbs at a moderate angle but it is only a short distance to the trackway. A line of rocks across the trail designates the beginning of the trackway. This picture was taken from the hillside above the tracks and some of the tracks have been outlined to give an idea of their layout. The BLM has published a brochure with useful information about the site as well as a map of the tracks. To get the most of your visit you will want to print out a copy of the brochure and bring it with you because they aren't available at the trailhead. The sauropod tracks were made by an unknown species of brontosaur. Sauropod comes from latin and means 'lizard foot'. The large holes that are full of sand were made by the hind feet which were up to 2 feet in diameter. Tracks from the front feet are smaller and more shallow but are also present. The BLM brochure makes them much easier to spot. The theropod tracks were made by various sized carnivores. The range in size from 8 inches to 15 inches. Theropod comes from latin and means 'beast foot'. The marks left by the claws are almost startling as they leave an impression in your mind of how deadly they must have been. It is illegal to make plaster casts of the tracks but it is perfectly fine to pour a little water in them for a better picture. Theropod tracks look a lot like bird feet. Whenever I see theropod tracks it reminds me of a turkey track and whenever I see a turkey track it reminds me of dinosaurs. The Morrison Formation and dinosaurs are almost synonymous so whenever we are hiking in it we like to keep our eyes out for fossils and tracks. The area around the trackway has numerous fossils that would take someone more expert than ourselves to tell all of the plant ones from the animal ones. We had to throw in a picture of the cute little privy at the trailhead. The open air toilet was actually very clean and quite suitable for this location. Just like the Mill Canyon Dinosaur site, a few more miles down the highway toward Moab, the Copper Ridge site is close enough to the main road that you can add it to one of your other trips to the area such as a visit to Canyonlands or Arches National Parks. And whenever you are hiking through the Morrison Formation keep your eye out for tracks and fossils and maybe you can make your own new discovery. If you would like to see it for yourself then all you have to do is 'Take a hike'.